Beauty, they say, is in the eye of the beholder, and the Karmann Ghia Type 34, or “razor edge” is one classic car that is still generally considered to be beautiful, although perhaps a little “different”. Wilhelm Karmann bought his first coach building business in August 1901 and soon developed a solid reputation as a motor body builder, although horse drawn carriages were still the main part of his business. Despite his business being effectively destroyed by two world wars, Karmann persevered, and in May 1949 came to an arrangement with Volkswagen to manufacture a convertible variation of the popular Beetle sedan. The first production car was delivered in August 1949, and thus began the long term relationship between VW and Karmann. Approximately 330,000 Karmann Cabriolet Beetles were made before the model was discontinued in January 1980. By 1950 Volkswagen was in discussions with Karmann to design a sports convertible based on the Beetle chassis, and although several small scale clay mock-ups were produced over the next two years, none of them was acceptable to “management”. In 1952, Wilhelm Karmann Jnr, now head of the company, commenced secret discussions with Luigi Segre of the Italian design house Carrozzeria Ghia for some “fresh” ideas for the VW sports car. In September 1953 Ghia produced a full size prototype Coupe to Wilhelm Karmann. Thrilled with the concept, the prototype was in turn presented to Volkswagen in November 1953, and by the end of the year contracts had been signed to produce the new car which would carry all three names of the originators; VW, Karmann and Ghia. The first Karmann Ghia was officially introduced to the public on July 14, 1955 and by October 1955 was available in German car showrooms. Public demand for the “new VW” was immediate with more than 500 KG coupes produced by the end of the year, and the Karmann factories struggling to meet demand. Although based on the standard VW Beetle chassis, suspension and mechanicals etc, the smooth, stylish and sporty body found many fans. Performance from the standard 1200 cc motor wasn’t spectacular, but a more aerodynamic body and improved handling certainly made the driver feel “sportier” than if driving a standard Beetle. A convertible version of the Karmann Ghia followed in 1957. 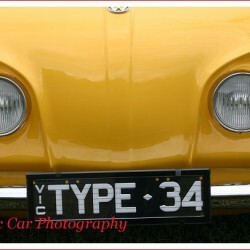 When production of the Type 1 Karmann Ghia finished in 1975, around 283,000 coupes and 81,000 cabriolets had been built. By the mid 1950s, Volkswagen knew that they needed a replacement for their now dated Beetle; something that offered more power, comfort, standard equipment and more room. VW knew also that they needed to enter the middle class marketplace. Part of the key to finding the replacement was a modification to their flat four motor – by relocating the fan shroud and running the fan off the crankshaft, VW ended up with an engine layout that increased space in the rear of car and provided additional luggage space. A new body design with added features not found on the Beetle and a 1500 cc “pancake” motor was produced and designated the VW Type 3. The model range included a sedan (known as the Notchback) and a station wagon (or Squareback). Turning to the successful team of Karmann and Carrozzeria Ghia again, the Type 3 range also included a sports coupe; the Karmann Ghia Type 34. The new line was officially introduced at the Frankfurt Auto Show in September 1961, and the new cars were an immediate success. The Karmann Ghia Type 34 was the most expensive VW model available, the fastest, and the most luxurious, although the new body style was somewhat controversial. Features included fog lights, cigarette lighter, electric clock, front and rear vent windows, locking steering column, variable wiper controls and the option of an electrically operated sliding steel sun-roof. The body was beautifully handcrafted and the interior trimmings include well fitted carpets, padded sunvisors, etc. There is room for luggage up front and also above the motor. Plus the rear seat can be laid flat if extra space is required. Locating the battery under the rear seat, and the spare tyre vertically in front of the “boot” also conserve interior space. The seats are comfortable and the driving position is good, if perhaps a little low. All necessary controls come to hand quite readily and the instruments are well positioned. Noise levels are a lot less than in previous model VWs. Originally fitted with VW’s standard 1500 cc motor, 1964 and1965 models had the same 1500 cc motor but with dual carbs and domed top pistons, and were called the 1500 S model. The 1966 model was fitted with the new 1600 cc dual carb motor, and models for 1967 to 1969 featured the 1600 cc dual carb motor with Volkswagen’s new 12 volt electrical system. Although exported worldwide, the Karmann Ghia Type 34 was never officially exported to the USA, and this perhaps at least partly explains why the total production was only some 42,500 coupes built between 1961 to July 1969.